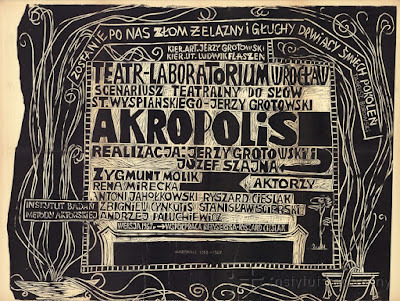 A performance based on Stanisław Wyspiański’s dramatic epic poem, first presented at the Laboratory Theatre of 13 Rows on 10 October 1962. Staging: Jerzy Grotowskiwith Józef Szajna who, among other things, was responsible for the set design, costumes and props. Initially the mise en scène was to have been created by Piotr Potworowski, but he died on 24 April 1962. Wyspiański’s poetic drama, written between 1903 and 1904, is set on the night of Easter Saturday with works of art in the Wawel cathedral in Kraków coming to life. In act I, statues from tombs become animated, in acts II and III it is figures from tapestries, while in act IV the carvings from the choir come alive. Wyspiański’s text is a certain summa of Mediterranean culture combined with themes from Polish history (see act I), Homeric sequences (act II depicts a night in besieged Troy) and Biblical themes (act III is the story of Jacob, while act IV includes the song of David the Harpist). All the acts are set on the Wawel Hill, the central site of Polish historical consciousness, which is effectively visited by all the grand Judeo-Christian myths. The main theme of Akropolis is, then, resurrection, considered both as salvation from death, inertia and forgetting, but also a task beholden upon each human being. In the version staged in Opole by Grotowski and Szajna, these complex themes acquired an additional dimension, with the text’s reality transferred to a concentration camp. In the performance, then, Auschwitz became ‘our Acropolis’ – a synthesis of the contemporary age – whereby the grand myths of Western civilisation were confronted with the Holocaust, which for the artists was and remained a radical and unimaginable ordeal. The prisoners, in constructing a camp on stage and showing with intensity the hellish futility of life in it, therefore also created, using Wyspiański’s words as the foundation, a certain synthetic repetition of the history of humanity which forever returns to the same starting point – a site which is also the centre of inertia. The cycle of repetition was broken in the finale by the ‘leader of a dying tribe’ (played by Zygmunt Molik), who began a grand monologue that gradually transformed into a hymn in honour of the Resurrected (in Wyspiański this was the sun god Apollo-Christ). Following a series of ecstatic acclamations that revealed the arrival of the Saviour, a procession formed that carried the Saviour’s ‘figure’ – a corporal human-shaped form, in fact a ragdoll, with which the choir of prisoners entered a construction that symbolised a grave-crematorium. Once the final character disappeared into it, the opening words of Wyspiański’s drama became audible in the silence: ‘Poszli – i dymu snują się obręcze’ – ‘They are gone and the smoke rises in spirals’. This was the only response to the ecstatic prayer of those heading to their deaths and praying for salvation. Grotowski, Szajna and Gurawski again, as they did in Kordian, for example, located the audience and actors in one space. But instead of constructing through this a community, they used this physical proximity to create a situation of absolute distance, generated primarily through acting means. As a result of working on mimicry (those famous ‘life-masks’ created through faces frozen in grimaces), movements and the voice (Akropoliswas Grotowski’s first performance to be permeated significantly by music and musicality), the actors not only created protagonists who completely negated the presence of the audience through their behaviour, but also evoked an audio-visual environment that generated an impression that one was in an alien and hostile world. In this way it became possible to depict on stage the unimaginable reality of the camps. And this was considered the creators’ and actors’ great achievement, which was evidence of their exceptional technique. Akropolis is considered a particular realisation of the poor theatre and is still considered one of the canonical masterpieces of twentieth-century theatre. Shown for the first time in October 1962, the performance underwent numerous changes in the following months and years. The creators marked the changes by announcing premieres of different versions which – beyond the changes in cast noted below – feature significant differences that have yet to be fully researched. The cast of the first version was: Maja Komorowska, Rena Mirecka, Zygmunt Molik, Zbigniew Cynkutis, Antoni Jahołkowski, Ryszard Cieślak, Andrzej Bielski (Ewa Lubowiecka also participated in rehearsals). The second version was first presented on 25 November 1962 with Maja Komorowska missing from the cast; her place was taken by Maciej Prus which resulted in the dialogue of love between Helena and Paris becoming an exchange between two male lovers. 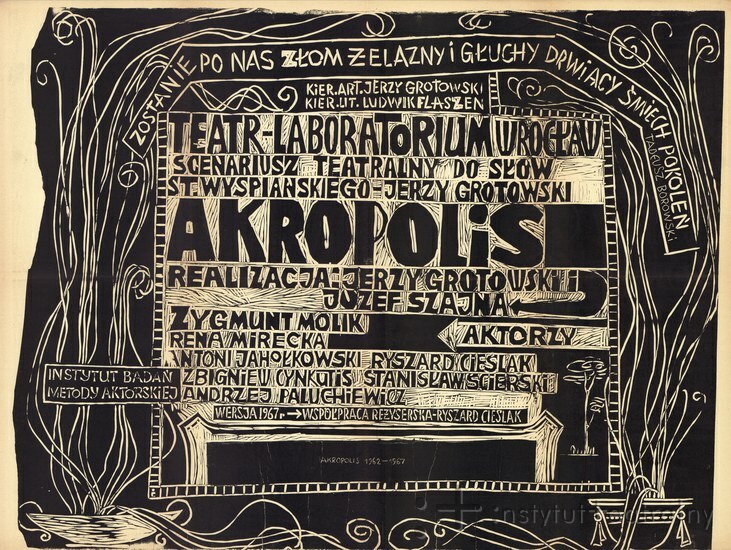 The premiere of the third version took place on 10 June 1964 (Zbigniew Cynkutis and Maciej Prus had left the group, while Mieczysław Janowski and Gaston Kulig joined), while the fourth version was shown for the first time on 16 January 1965 in the theatre’s new space in Wrocław. The best known is the fifth and final version with Zygmunt Molik (as Jacob and the Harpist), Rena Mirecka (as Rebecca and Cassandra), Antoni Jahołkowski (as Isaac and the Guard), Ryszard Cieślak (occasionally replaced by Czesław Wojtała as Esau and Hector), Zbigniew Cynkutis (as Laban and Paris), Stanisław Scierski (as Clio and Helena) and Andrzej Paluchiewicz. This version was first performed on 17 May 1967 in Wrocław and then on foreign tours, beginning in Amsterdam (18–19 June 1967), Utrecht (20 June 1967), The Hague (21–22 June 1967), Rotterdam (23–24 June 1967), Brussels (26–28 June 1967), Edinburgh (22–30 August 1968), Paris (24 September – 26 October 1968), Aix-en-Provence (4–26 November 1968), and New York (4–15 November 1969). This version was also filmed between 27 October and 2 November 1968 by US television (produced by James McTaggart; the television broadcast was introduced by Peter Brook). The first and second versions were performed outside Opole during guest performances in Wrocław (12–14 November 1962), Poznań (16–19 November 1962), Złoty Stok (4 December 1962), Gliwice (6–7 December 1962), Katowice (9–11 December 1962), Łódź (20 February – 3 March 1963, and Kraków (9–15 May 1963). The fourth version was presented in Kłodzko (18 June 1965).